After Lent comes the most light and joyful day for all Orthodox Christians - Easter. And any holiday table is complete without the traditional dishes: cakes and painted eggs. How beautiful to paint eggs, perhaps today is known to many, because modern dyes and labels of all kinds to buy now, you can easily. However, not everyone knows how to paint eggs for Easter with their hands: with the help of onion peel, no new-fangled "devices." Frankly, I prefer this "grandma" method (thermal labels, though bought, but did not use colored dyes never). And not just because it is more natural, natural, or what; but also because it is so beautiful eggs our ancestors, so I'm used to seeing an Easter egg on the holiday table, so I find it really beautiful! Although, of course, it's all a matter of taste. I want to tell you how nice it is to paint eggs using onion peel. Make it really is a lot easier than it seems. It seems to me, it is even easier than paint the eggs with the help of store dyes. All you need is onion peel (about a half-liter jar, or in its sole discretion) and pan. Optional - the old nylon stockings and young leaves of parsley and other "shaped" green (if you want to get beautiful pictures on the painted eggs). Yes, the word of the husk. Thrifty housewives, usually in preparation for Easter, start to collect it in advance. But this is not about me :) I'm going to the store on the eve of, where you can choose the vegetables without any problems on their own and by selecting onions, dial as many husks in your package, how much I need. Problems with this yet never was. So, if before Easter you find that you have no onion skin, take this method as interesting! And now - directly to the case. Pan can take any size, as long as the entire husk it fit. But water is not poured a lot of advice, so the onion broth is most concentrated. Optimally - 1-1,3 liters. Fill the shells with cold water and put on fire, bring to a boil and simmer 5-7 minutes. Yes, the water can be a bit of salt to the egg and then in the process of cooking does not burst. Remove the pan from the heat and let the broth cool down minutes 30-40 (of course can be longer, if the broth to cook the onion in the evening and let it brew for the night, it will be all perfect :). Eggs Prepare to paint: wash under running water. If you want to get the output unpretentious patterns, as in the photo, the "glue" to the egg water plant leaves or small flowers, carefully wrap in a stocking, tie the ropes on both sides. As such, and lower the eggs in onion broth. You do not want to drawings, then simply put the washed egg in a pan with broth (it should not be hot!). An important point: if all at once the eggs are not fit, cook their meals. Bring to a boil, and then simmer 10-15 minutes, depending on how intense you broth, and whether he had time to brew. Eggs must be periodically stirring, stirring, the color was nice and uniform. Ready Krashenki catch a spoon on the plate, let cool slightly (remove the nylon if it is wrapped in eggs), and then rinse with a little under running water. To all the eggs out of uniform color and saturation, are advised to make a decoction in the evening and let it brew for the night. Before cooking eggs strain broth, throwing the husks. Also, if you want a bright and rich broth, then pay attention! Onion peel color is different from yellow to red and even purple. What is better to choose to paint the beautiful eggs? It's simple: the more intense the color of the peel, the more beautiful it will be painted in the eggs. Beautiful burgundy shade from eggs obtained when the predominant red and purple husks. I tend to dial it in different shades. For colored eggs glistened and were glossy, some housewives little rub them with vegetable oil (need just a drop). Thermal used after the eggs are painted and have cooled down. 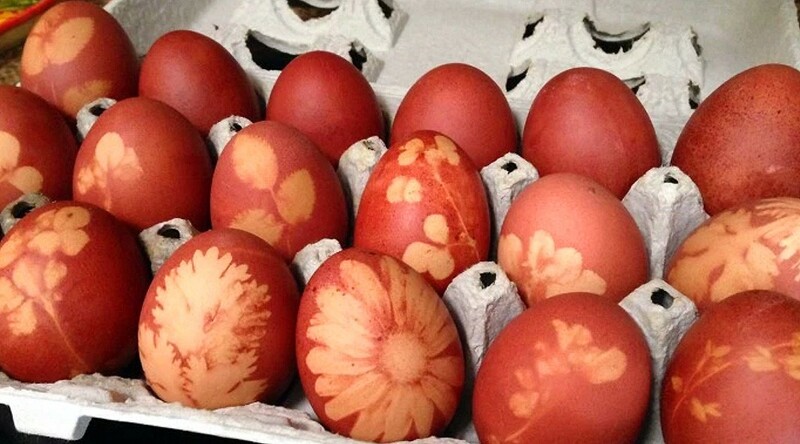 Well, now you know all about how to paint beautiful eggs to happy Easter.